Non-surgical treatments are extremely popular now, too, and have become well integrated within the cosmetic surgery industry. Patients often opt for these treatments, as they do not require incisions or any removal of tissue, the results are temporary, and there is much less downtime and risk associated. Thanks to tech knowledge we have options? The non-surgical Face Lifting treatments are all the rage, and are here to stay. It has come a time where more people are embracing the aging process but still want to have Healthy,Vibrant, more Luminous Looking Skin. All over! Remember always that Skin Care does not stop at your face. Our skin is our largest organ and needs care like the rest of our precious organs. Thanks to publicity, the non-surgical anti-aging treatments such as Botox® and Dermal Fillers have taken over the market. There has been a staggering 55% increase in non-surgical treatment enquires, with the market worth an estimated £18million a year in the UK. The noticeable advance in technology, mixed with education and training for practitioners has generated a positive outcome in the forthcoming developments of the non-invasive world. It is commonly used to treat the forehead, under the eyes, cheeks, mid-face, jaw line, and neck. Based on current RF technologies, most people should see a significant improvement in their skin tightness, with minimal risks and downtime compared to surgery. 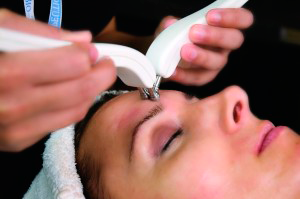 Prices for radio-frequency facial tightening treatment depend on the desired area(s). For example, many clients like to treat their chest, arms,and so on. Radio-frequency facials have become a top Pro-aging treatment, with clinical trials producing noticeable results. 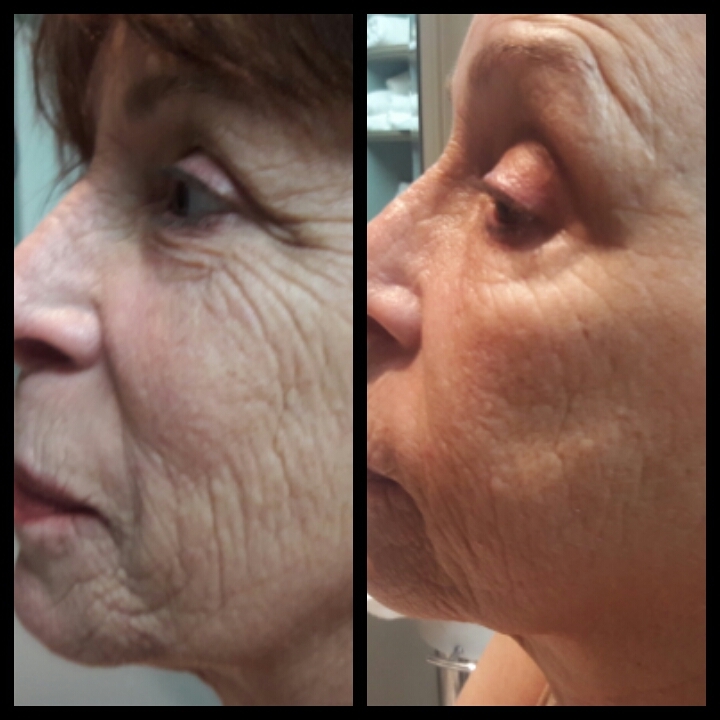 In my research on tissue tightening devices, radio-frequency facials can minimize wrinkles and fine lines on the face. Diane Marie also discovered that when radio frequency is applied to problem areas like the thighs, it can help reduce the appearance of cellulite. These facials use devices that have unipolar or bipolar radio frequencies, or a combination of both, to deeply penetrate the skin with thermal energy directed into the subcutaneous layer, describes Diane Marie. Bipolar energy provides superficial heating, while unipolar goes much deeper into the dermis. Heat initiates collagen synthesis as radio frequency ultimately damages the skin. Tightening occurs during the course of the skin’s self-repair. If you’re going for a radio-frequency facial, plan for a 60- to 90-minute appointment. The treatment begins with make-up removal, skin cleansing , followed by the use of an Ultra Sonic Skin Scrubber for ultra clean skin, making to a better penetration of product and current. A cooling gel is then applied stimulating collagen and support the treatment’s effects aiding to hydration and antioxidant protection. 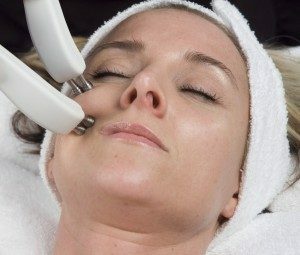 This is followed by an Radio Frequency wand radiated around the face,working in conjunction with your lymphatic system to further stimulate collagen production. While positive changes are often seen after the first treatment, at least six treatments are recommended one week apart for complete results. Treatments can have ever lasting effects with 6 to 8 weeks maintenance treatments thereafter. Non-Surgical FaceliftMicrocurrent is known to be the most effective non-surgical method to take years off the face. My treatments take the efficacy of microcurrent to a new level by pairing it with Radio Frequency Thermal Lifting,or all by it self. Since microcurrent is sub-sensory, most patients fall asleep during treatments. Not all microcurrent equipment is created equally. The ability of microcurrent to positively effect the tissue and the results that are achieved are completely dependent on not only the sophistication and engineering of the machine, but also on expert application by a trained practitioner. Non-Surgical FaceliftWe first need to understand what causes our facial skin to wrinkle and sag. As we age, our muscles become accustomed to certain expressions and tend to get stuck in these positions. A great example of this is the furrow between the eyebrows that many people get. At the same time, other muscles in our face are hardly ever used, and they begin to atrophy, which leads to sagging. An example of this can often be seen around our jaw lines, chins and necks where we tend to develop sagging or loss of definition as we get older. As we age, skin cells become less active, which leads to a breakdown of collagen and elastin. By the age of 45, the upper cheek muscles may elongate by as much as half an inch, dragging the skin over the cheeks downward to form plump little pouches at the corners of the mouth. The muscles under the chin become loose and the jaw line loses its firm contour. Non-Surgical FaceliftThe number of sessions depends on the client age and skin condition. The effects of microcurrent are immediate and cumulative. Clients go through a series of treatments followed by regular maintenance to keep a more youthful appearance. Each time a treatment is performed the new contour maintains its position better and longer. 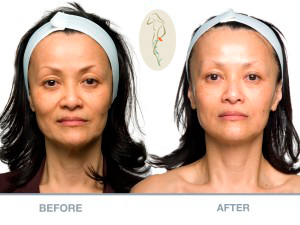 Typically clients will notice about 5 year reduction in facial aging.